I made a wonderful discovery at the last Komiket, a Filipino Komiks art market participated in by over 400 komiks creators. 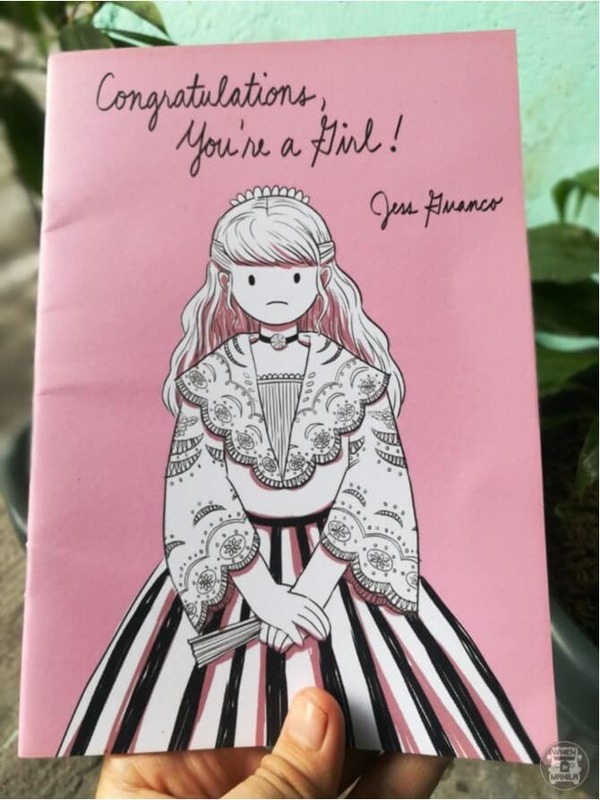 I discovered that several young Filipino creators, all women, had put in the spotlight Herstory. Herstory is the story of every woman needing a voice, a way to be heard. These works surprised me. I had not realized that komiks could be such a good medium for raw, honest truths, illustrated so well by our young talents. As a female myself, their works got me to look deeper into certain issues affecting me. I’d like to pay homage to this bravery by featuring selected titles. Here they are. I hope you will also consider checking them out. Congratulations, You’re a Girl! by Jess Guanco is dedicated to all those who are girls by default, girls by choice, and girls deep inside their soul. This book tackles the gender-based demands, expectations, and prejudices of society on women, limiting their choices, and even getting in the way of their dreams. It is a story about finding oneself. Kabuwanan by Haliya Publishing is a collection of seven thought-provoking short stories depicting the different representations of and symbolism in today’s women, from a millennial constantly making excuses at work to a preteen dog experiencing her first menstruation, from streetsmart bruha (witches) to a harassed nurse chasing after something, from a girl crushing over a classmate to a lonely young woman in and out a room (sometimes empty, sometimes not), to a powerful babaylan (warrior-priestess) fighting for the life of a patient against a powerful entity. I can’t claim to understand some of the stories, but I can say the collection by itself has power. The creators are Hulyen, Triszha Ko, Laraine Gazmen, Hannah Puyat, Lizette Daluz, Mich Cervantes, Pauline Rana, Kay Aranzanso, and Emiliana Kampilan. Cover is by Justine Basa. 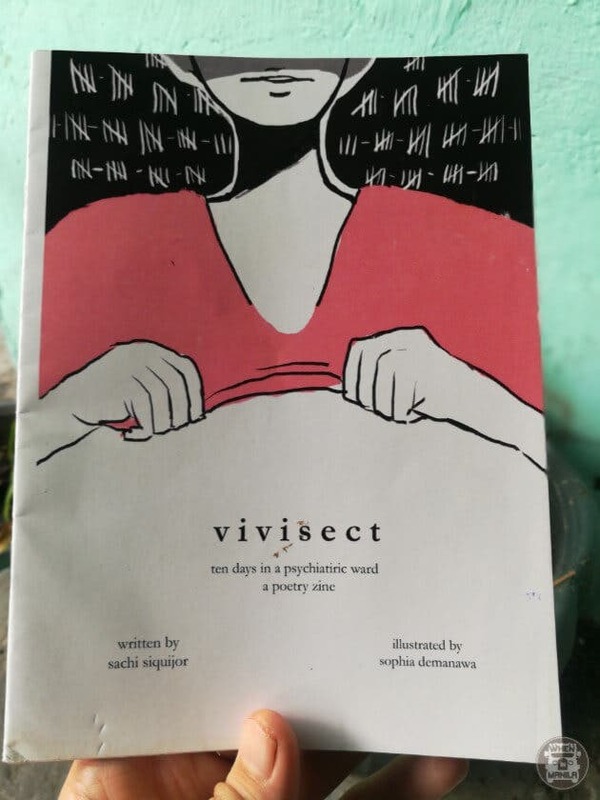 Vivisect written by Sachi Siquijor and illustrated by Sophia Demanawa is a product of the author’s 10-day stay in a psychiatric ward. Visceral, disturbing, illuminating, this book is the gut-wrenching confessions of a person living with anxiety and depression. The creators hope to “shed a little light” into the illness that few people bother to understand. Did our questions make you curious about Womenstruation? Cosmic Alexithymia by Elle Geronimo has a very different tone and voice from the author’s other work, Womenstruation. This book is introspective, shy, questioning, and an overall positive piece of work by someone searching for her place in life. It transforms the author’s transcendental musings into the meaning of life into poetry and stark black-and-white illustrations. If Womenstruation was a grumpy, in-your-face commentary on the earthly body, Cosmic Alexithymia is the whispered yearnings of a young soul, reaching out to the universe. In a society that has a dearth of women’s voices, the world of komiks has made sure to give young female komiks creators a platform to express themselves and portray issues important to female readers. In Herstory, komiks creators I am glad to see are strong and determined characters. Would you like to read any of these komiks? Share your thoughts with us! ENTERTAINMENT: Paulo Avelino Tweets About His Love Life And We’re All #Shookt!